Can PowerPoint Make You Stupid? This is an excerpt from the third edition of Rick Altman’s provocatively-titled book on presentation best practices. Available now in paperback, PDF, ePub, and Kindle. You can learn more about it at the BetterPresenting website. ONE OF THE MOST INFLAMMATORY ideas circulating among PowerPoint skeptics has received quite a bit of credible press in the past decade. In a widely-circulated 2004 article, New York Times columnist Clive Thompson all but blamed the space shuttle Columbia accident on the use of PowerPoint. (www.whypptsucks.com/shuttle). And the ever-bombastic Edward Tufte has essentially made a living out of attributing many of society’s communication problems to Microsoft’s venerable slide-making tool. It’s hard to imagine that a software program could be credited with something as profound as affecting one’s intellect, but read on—there is a real dynamic at work here. Several years ago, my friend Lon came to me for assistance with a keynote address he was giving to a group of professional tennis teachers. These teachers were working with some of the most talented junior players in Northern California; their jobs were to turn these kids into seasoned athletes, help them land college scholarships, and maybe prepare them for professional tennis. Lon had some innovative ideas about how to turn kids with raw talent into strong competitors and winners. As an avid tennis player myself, I loved talking with him. When his ideas were flowing, he was a joy to listen to—fluent with such heady concepts as the ideal performance state, living in the present moment, and his most novel theory, having to do with calming the mind to maximize the body’s energy. Lon needed to distill all of his wonderful ideas into a 45-minute after-dinner talk, and he made the mistake of creating PowerPoint slides as part of the process. Here was his weak attempt to fit his thoughts onto a bullet slide. It sounded like mumbo-jumbo, something his ideas never did when he spoke about them informally. Worse, when he practiced his speech with his slides, he found himself trying to explain the meaning of the words on the slides, instead of just sharing the thoughts in his head. I call this “going on defense” and it is a sure sign that you are at risk for committing Death by PowerPoint. Ultimately, I convinced Lon to go with the following slide instead. His ideas were more than enough to carry the hour; all he needed were a good image to evoke an emotional response and a few talking points. And when he realized that his original slides were doing him no good, he decided to forego slides altogether. Good call, Lon. This slide did not inhibit Lon’s ability to articulate his thoughts. This was a classic example of good ideas getting torpedoed by PowerPoint. Lon’s ideas were far too nuanced to be contained within one title and three bullet points. Most good ideas can’t survive such a boiling down, yet that is the default medium for sharing ideas in public. When smart people try to represent their good ideas with such a limiting medium, they come off sounding less smart. PowerPoint does indeed dumb them down. One chapter from now, you will read about my prescribed “three-word challenge”—a call to distill long bullets down to short ones. This might sound like a contradiction to the point I am making here, and it certainly won’t be the last time you feel that way. I will explain the difference more fully then; for now, I will specify that the danger here is trying to use bullets to explain an idea, instead of just represent it. Unless presenters practice with their material and with the medium, even simple and succinct bullets can derail them. I witnessed a good example of this while watching a volleyball match on ESPN (lots of sports analogies, I know—I’m pathetic that way). Calling the action were Chris Marlowe, an experienced play-by-play professional, and Vince, a former Olympic player. Each of them was required, at various times during the broadcast, to comment on a statistic or a notable fact being displayed in a graphic. One of Vince’s assignments was to discuss the factors that he thought were significant during a particular match. The graphic displayed three items: return of serve, ability to set a double-block, and free-ball passing. With only a few months of experience as a television commentator and no formal training or background, Vince did nothing more than read, word for word, the three items in the graphic. He would have done far better if he were instructed to describe, in his own words, the three key elements of the match. The audience didn’t need to see the graphic, but when ESPN showed it, it paralyzed Vince, reducing him to a cue-card reader. Now that’s the way to speak to bullet points! Marlowe didn’t insult his audience’s literacy by reading the graphic. Instead, he made the moment greater than the sum of its parts by telling us something more than just the raw facts. While inexperienced with talking points, Vince proved to be an acute analyst of the game. When allowed to simply react to what he was watching, he was articulate, relaxed, and confident. I suspect there are many executives and corporate speechmakers who are like Lon or Vince: astute, well-spoken, but ultimately hampered by the implicit (or explicit) requirement that all high-tech speeches be accompanied by a PowerPoint slide show. I had lunch recently with a Silicon Valley-based executive and he summed up the situation perfectly. First, he acknowledged that most of his colleagues are too busy to spend more than a half-hour working on their slides. “Is it so important that they have slides?” I asked. You can’t give a talk today without showing slides. Those are some of the most distressing words I have ever heard. Too busy to spend more than 30 minutes on their slides. Executives with good speaking skills don’t necessarily need slides as they speak, and if they do, their slides should elaborate on their ideas, not repeat them. And executives who lack speaking skills make the situation worse with bad slides that compel them to read their speech instead of deliver it. Where do people go wrong? Often, their fatal errors are made in the first 10 seconds of a project: they put hand to mouse, after which it becomes exceedingly difficult to think creatively. Even though it doesn’t involve PowerPoint, a recent experience I had crystallized this issue for me. On a flight home a few years ago, I sat inbetween two businessmen, both using their notebook computers. I couldn’t resist spying on them. One of them was using CorelDraw, a graphic drawing program that I have been using since its inception in the late 1980s. The other was composing in Microsoft Word. The man using Draw was producing some sort of flier or publicity sheet, and he was struggling. He kept creating objects and text strings, fiddling with them, and then deleting them. He appeared to have no direction or objective. Well, the irony of this situation was delicious. The man who least needed to use pencil and paper before embarking on a computer-based project couldn’t work without them, and the man who desperately needed to do a bit of sketching or scribbling was trying to create a drawing using an eraser head to move the cursor. Why do we computer users do this to ourselves? Let’s first point out the obvious: when you embark on a task—any task—first you decide what it is you want to do, then you determine how you are going to do it, and then you do it. That’s how people do things in real life. All too often, however, users of creative software, like CorelDraw or PowerPoint, go about everything backwards. They sit in front of the computer, place their hand on the mouse, and start creating objects, hoping that a finished piece will spontaneously occur. In no other aspect of their lives do they expect to achieve success in this manner, but they hold exempt from natural laws their relationship with their software applications. This was certainly the case with the man in seat 16C. He knew that he had to produce a flier on a particular topic, but I doubt that he started with much more direction than that. He kept drawing shapes, creating text, moving them around, stopping, thinking, stretching, rotating, filling, deleting, redrawing…and all the while growing visibly frustrated. He expected CorelDraw to act as his sketch pad, or better yet, to magically produce the flier for him. We see this same dynamic among PowerPoint users, usually to the same detriment. The cold hard fact is that programs like CorelDraw, Photoshop, Dreamweaver, and PowerPoint are the wrong tools for the beginning phases of a project, totally wrong. This is not a criticism of PowerPoint and the others—let’s please just acknowledge that these programs are finishing tools, not starting tools. 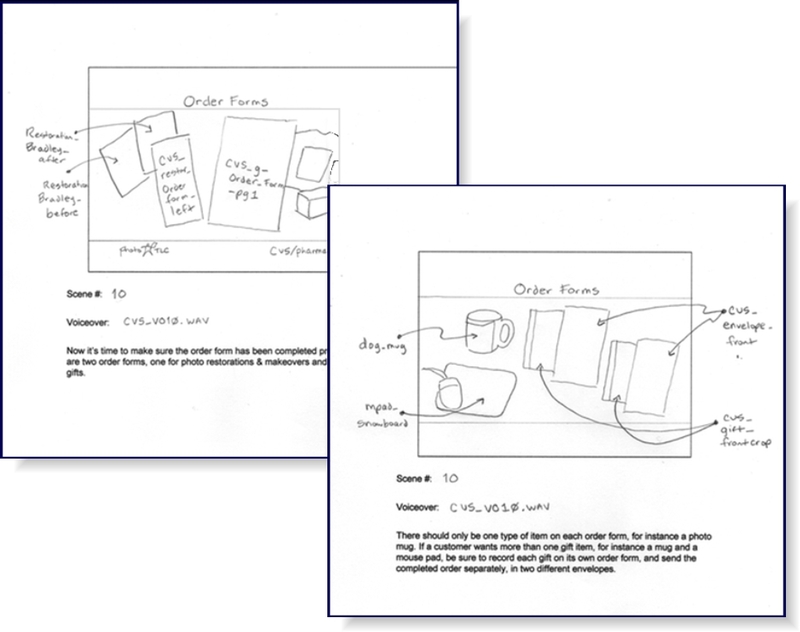 PowerPoint lets you do a lot of things quickly and easily, but sketching or roughing out a creative concept is not one of them. There’s way too much temptation to make everything perfect, and that’s exactly what you don’t want to do at the initial stages of a project. When starting work on a presentation, experienced content creators look to get ideas out as quickly as they think of them. This is the time to open the creative canal as wide as possible—to scribble, cross out, throw away, start over, blab to colleagues, and do all of that all over again. It is not the time to be thinking of transitions, animation choices, backgrounds, or color schemes. In fact, it’s not the time to be handling the mouse at all. The man in seat 16A had the right idea. While only creating a word-processed document, he realized that he’s better off mapping out his route on paper first. Even a simple program like Word offers too many temptations to make a first draft perfect, what with spell and grammar checkers, document controls, wizards, and paragraph formatting tools. He just wanted a brain dump, and the best dumping ground is the legal pad. He didn’t have very good handwriting; I doubt that he got an A in third grade penmanship. But that is of no consequence during the idea stage. Here is a sketch of a presentation prepared by Julie Terberg, one of the most prominent and talented presentation designers in the world. She is a regular at the Presentation Summit, where she shares her vast knowledge of design theory and how it is best applied to the presentation medium. Even the pros begin with pencil and paper, not with slides. It is not the product of your sketching that is so important to the process, it is the act of sketching. Sketching…doodling…free-associating…these are the secret ingredients to brilliance! Kind of funny when you think of it. One of the secrets to using PowerPoint effectively is knowing when not to use it. Your comments about people having only 30 mins to make slides certainly made me think. Perhaps a good way to go in those circumstances would be to make Lessig-like slides, with only 1 word or a key number (e.g. June’s sales total) on each one. For variety, another option would be a *very* simple diagram — I’m thinking a Venn diagram of 2 overlapping circles or similar. SmartArt might help to get a polished result very quickly. Thanks for the thought-provoking content Rick!